Some of the earliest concerts I ever attended were at a church in Georgetown with no shortage in space – the youth area was used for a few years (maybe, hopefully, it still is) as a space to host a concert series called “Harmony Presents.” And one of the earlier iterations of this band – The Likeable Inbetween – was no stranger to the venue and its concert series. 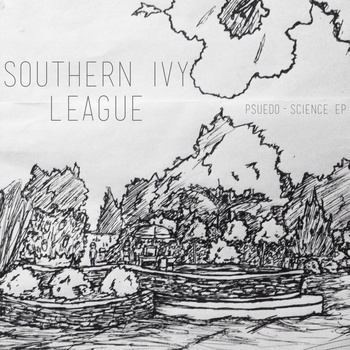 Carrying over the two core members of the band, Matt Eddy and Ryan Parker, the two joined with Christian Barnett and adopted the title “Southern Ivy League” – presumably in reference to Parker’s enrollment at Vanderbilt University. I’ve heard the latter two songs on the EP before – but in limited instrumentation. These familiar songs are fleshed out in a really nice way, drums, pianos, and some really interesting mastering, not to mention the use of electric guitars in lieu of acoustics and ukeleles. This gives the music a much greater presence and some sort of warmth that comes in with a sound that sounds like Modest Mouse’s earlier work – if Isaac Brock wasn’t afraid to write to write with a little more pop. In fact the guitar sounds on the opening track, “Everything in Moderation,” reminds me a lot of some of the work done on This is a Long Drive for Someone With Nothing to Think About, though it’s immediately apparent that Eddy’s voice isn’t really much like Brock’s. It’s a really solid EP, and though the band has grown up since their days of singing songs like “Billy the Transvestite,” especially musically, they’ve retained the youthfulness and energy that made them such a hit in the small town they grew up in. Tracks I Liked: Everything in Moderation!, Over the Pipe! !, Pseudo-Science!! !, I am in Love with You (But it’s Not Important)!! !